The Lennon Sisters, circa the early years, Kathy, left, Dee Dee, back, Peggy, and Janet, front . In what might well have been one of the greatest Christmas entertainment gifts ever, Lawrence Welk introduced the four lovely and talented Lennon Sisters to America during his national TV show on Christmas Eve of 1955. 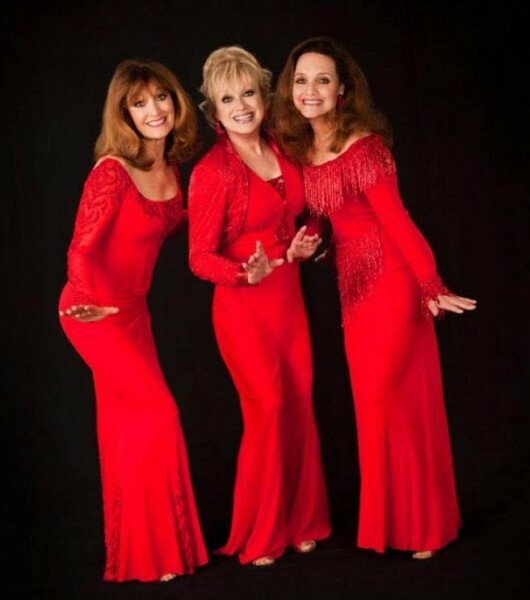 America fell in love with them and now, 60 years later, ‘America’s Sweethearts’ are still entertaining, thrilling, and inspiring audiences with their one-of-a-kind vocal sound and personality. BTC: How did you discover your remarkable singing talents as a group? LS: We come from a family with a musical background. Our grandmothers were dancers, one of our grandfathers was a honky-tonk piano man, the other an Irish Tenor, and our father was a wonderful singer who sang with his brothers in a group called the “Lennon Brothers.” None of us read music, but we learned their harmonies by ear and sang around the house when we were little. It came to us naturally. BTC: Where were you born and raised? LS: We were born and reared in the beach town of Venice, CA. BTC: How would you describe your childhood? LS: Our whole family, my dad, his brother, over 30 cousins all lived in Venice. It was an amazing, wonderful, and loving childhood. It was great! BTC: What was the original reason the Lennon Sisters started singing professionally in 1954? LS: To help put an addition on our house. The whole family lived in a two bedroom-one bath house and mom and dad slept on a pull-out sofa in the living room. Daddy wanted to add a dormitory onto the house for the girls. We sang a church musical. People in the audience liked it and said they would pay us to come and sing for their organizations, and that’s what we did. BTC: How many brothers and sisters did you have? LS: There’s 11 of us, six girls and five boys. BTC: What part did Larry Welk play in getting you the opportunity to appear on the Lawrence Welk Show? LS: Dianne, Dee Dee, went to school with Larry Welk Jr. He asked her to go to a Halloween Party, but she said she couldn’t because she had to sing at the Elks Club. He went to the club to pick her up, heard them sing, and liked what he heard. He said that his dad had just started a TV show and that he was going to tell him about them. BTC: What were the circumstances of your first meeting with Lawrence Welk? LS: About a month later Larry called Dee Dee and told her to get her sisters together and come over to the house because his dad was home sick, couldn’t get out of the house, and that he wanted us to sing for his dad. When we got there, Lawrence Welk came out wearing a maroon smoking jacket and velvet slippers, sat down, turned to us, and said, “My son has told me all about you; now sing!” That’s how it started. It’s the only audition we have ever had. BTC: When did you make your first TV appearance on the Lawrence Welk Show? LS: On Christmas Eve of 1955. BTC: Do you remember the name of the song you sang? BTC: Which sisters made that appearance and how old were they? 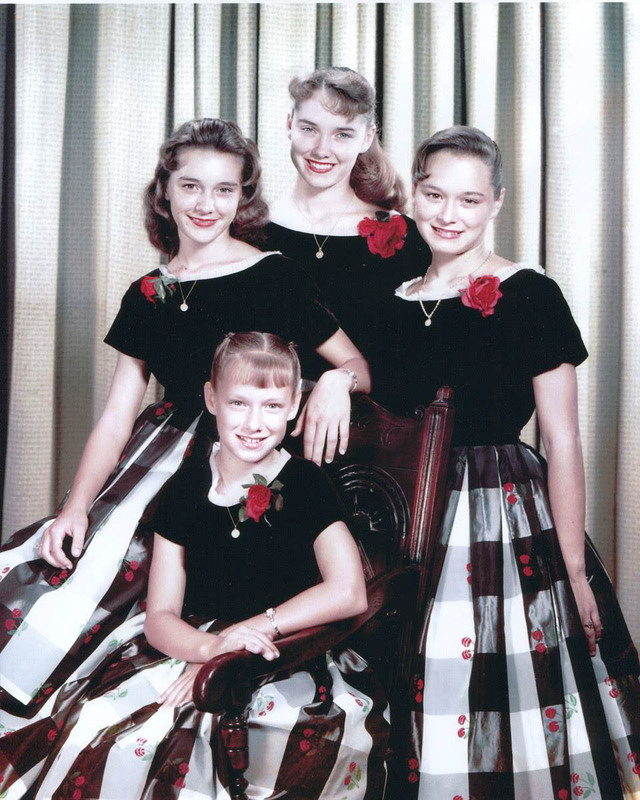 LS: Dianne, 16, Peggy, 14, Kathy, 12, and Janet, 9. BTC: When did Mimi join the group? LS: Although she sang with us as a fill in for many years, she joined us permanently in 1999 when Peggy retired. BTC: Except for the first performance, what was your most memorable moment while on the Lawrence Welk Show? JANET: I loved dancing with Mr. Welk and singing duets. BTC: When did you leave the Lawrence Welk Show? BTC: Did you go to another TV show? BTC: Did the appearance of the Lennon sisters on that show establish a new entertainment milestone? LS: Yes. We were the first sister act to star in their own national TV variety show. BTC: You have sold millions of recordings, but how many different songs have gone into those recordings? KATHY: “Sophisticated Lady,” but I can’t wait to record “Love Story” which will be on our new album. BTC: Has a book been published about your remarkable career? LS: Yes, we have an autobiography, “Same Song, Separate Voices.” It took us ten years to write and we wrote every word ourselves. BTC: Over the years, you have received numerous awards and recognitions. Is their one that means the most? LS: We are appreciative, grateful, and honored for all of the many awards we have received over the years, but being inducted into the “Vocal Group Hall of Fame” in 2001 and receiving a star on the “Hollywood Walk of Fame Star” has special significance. BTC: In a career filled mostly with highs, have you traveled through any valleys that could have ended the journey? BTC: Prior to Branson, when did you first start performing with Andy Williams? LS: In the 1960s and through the 70s on TV, Vegas, and Lake Tahoe. BTC: What part did Larry Welk play in bringing the Lennons to Branson? LS: We had never heard of Branson until we got a call from Larry Welk who said he was opening a theatre in Branson and asked if we would star in his show. BTC: How did you end up in Branson? LS: After Larry’s call, we called Andy Williams and others who were in Branson. They said that we belonged in Branson so we came, looked, and said, “Maybe we can do this for a year.” We are now celebrating our 22nd season in Branson. BTC: How many Lennons moved to Branson originally? BTC: When did you start performing in Branson? LS: In May of 1994 at the Welk Resort Theatre. BTC: When was the first time you performed on the “Andy Williams Christmas” show prior to coming to Branson? BTC: When did you start performing at the Andy Williams Moon River Theatre? BTC: What was the name of the show? LS: We did two different shows, “An Evening with the Lennon Sisters” and the “Lennon Sisters Christmas Show.” We performed our Christmas Show in the afternoon and performed in the “Andy Williams Christmas Show” in the evening. 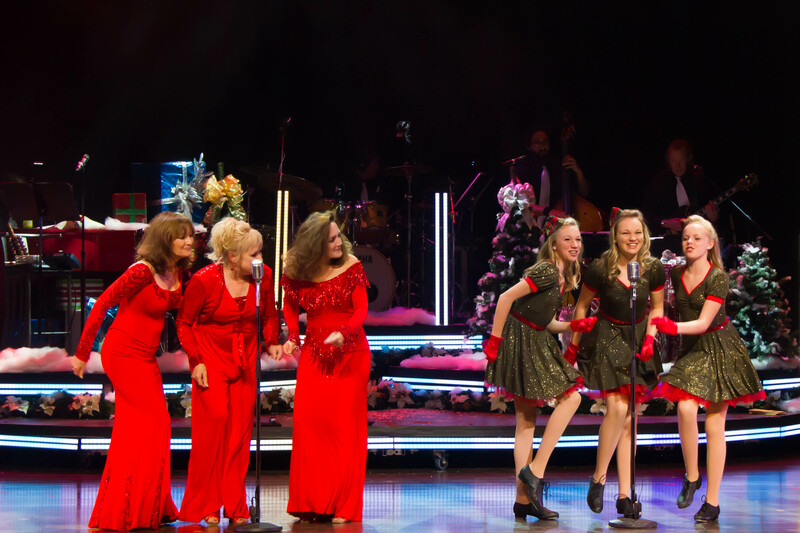 One of Andy’s last wishes was that the Osmond Brothers and Lennon Sisters would continue his legacy and perform his traditional Christmas show. We have been performing with the Osmonds in the “Andy Williams Christmas Show” for the last three years and just love working with them. BTC: Whether in Branson or not, what was your favorite Christmas memory of performing with Andy Williams? LS: In the early 70s Andy wanted us to perform in his Christmas show at Caesars in Lake Tahoe. We told him we never go out of town at Christmas unless we can take our families. It was worked out, and the whole family, including Grandma, went to Lake Tahoe to perform. Perry Como was doing his Christmas show right across the street at Harrah’s. At Christmas our whole family got together and went caroling to the houses of both Andy Williams and Perry Como. It was like the best thing ever! Janet’s favorite part of this years Andy Williams Christmas Show. KATHY: The “Ave Maria” and “Silent Night” medley. JANET: I love working with my granddaughters. They are just so much fun. 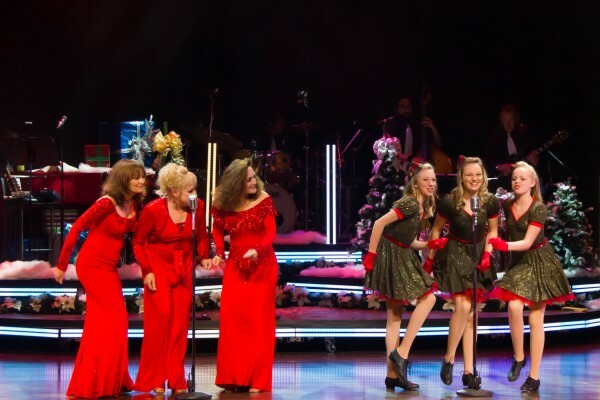 MIMI: Singing the “Christmas Song” with the Osmonds. BTC: As you complete the remarkable achievement of 60 years in show business, what is the one moment that has meant the most to you? LS: It’s not just one moment. The simple joy of being able to work with each other over these last 60 years and the special bond that we have is priceless. So, too, is the humbling experience of knowing that our music not only entertains our fans but, in many cases, has impacted their lives in some special way. LS: In terms of just one number, it would be singing “Close to You,” a capella with Andy Williams during some of our Las Vegas and Lake Tahoe appearances with him. We just sat around him on stools and sang. It was a little piece of heaven. BTC: Anything else you would like our readers to know? LS: We’re so appreciative of the fans who have supported us on this 60 year journey and hope people will come and see us perform, whether it’s in the Andy Williams Christmas Show in Branson, or one of the 10 to 15 dates a year outside of Branson. We think they will enjoy not only the wide variety of music we do, but the peaceful nostalgic journey back to a simpler time as viewed through the video flashbacks of our 60 year journey, and some of the amazing stars we have performed with. Whether two or 92, you will enjoy the show! For additional information or tickets to see the Lennon Sister perform in the Andy Williams Christmas Show, or any of Branson’s shows and attractions, or for lodging arrangements, please contact the Branson Tourism Center, one of Branson’s largest and most respected vacation planning services by calling 1-800-785-1550, or by visiting www.BransonTourismCenter.com. This entry was posted in Branson Shows, Featured on November 19, 2015 by Gary Groman.